James Lawson (right) and Nathan Schneider. Photo by Cynthia Boaz. 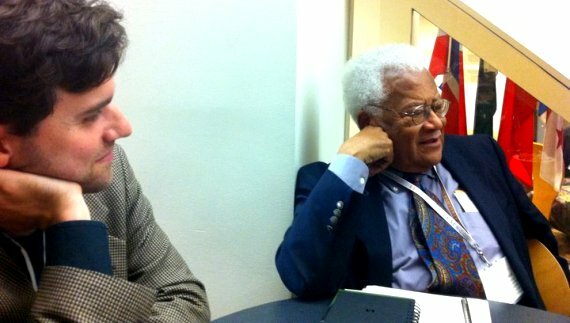 Over lunch last week, during the International Center on Nonviolent Conflict’s Fletcher Summer Institute, I had the chance to talk with civil-rights movement leader James Lawson with a recorder on. It wasn’t hard to get him going; he had been talking about these things the whole week. Lawson, who organized the decisive Nashville lunch-counter sit-ins, is above all a strategist. He insists on the need to develop long-range strategies, not just short-term tactics. But, as he showed during the ceremony for the first James Lawson Awards, he is also a theologian. NS: For activists trying to reclaim people’s power among all the powerful corporations at work today, what do you think can be learned from the civil-rights movement? What are the lessons from your experience? JL: Well, I think that the main thing that activists must learn is nonviolent philosophy, methodology, techniques, and strategy. They need to work from an investigation and assessment of their local base, determining thereby the skills and techniques that will organize and mobilize people in that local scene. No social movement is going to take place if it doesn’t have roots in what’s going on in Cleveland, Ohio, or Washington, DC, or way across Georgia. That’s how movements take place, and that’s how movements have taken place in the United States—not by national policy, but by local groups assessing their own scene and trying to be real about how to start working. I maintain that we have more than enough activists and activism in our country. What we do not have is a unity of understanding about how you go about putting that activism to work. We’re all over the ballpark. Very few people are playing the nine positions of the ball team that you’re going to need to defend, or have an offense. NS: How do you go about uniting disparate movements, or quasi-movements, or disparate groups of activists who want to do something? How do you bring them into a common cause? JL: A wide range of progressive organizations were in the streets while we were campaigning for civil rights. That movement affected many different kinds of issues. For the first time, in the Civil Rights Bill, the government said that hiring—in the public or private sector—could not be discriminatory by national origin, color, gender, or age. Disability came later. As a society, we had never given much thought to that before; if I was a business owner, I could just decide to hire my friends, rather than serving the public. But now, I had an obligation to certain values that strengthened the well-being of the nation as a whole. Many people don’t remember that during the period between about 1963 and 1968, the Congress, with an activist president—even though he got himself and the country entangled in Vietnam—passed the most progressive legislation that the nation has ever had. This included Medicare, Head Start, and federal grants to allow students to go to college at the expense of the tax dollar. Congress passed the first immigration-reform bill that turned immigration from a white-only policy to a more worldwide policy. It provided funds that nonprofits and local cities and towns could use to make sure there would be affordable housing available. It passed an anti-poverty program, making money available to local citizens and their governments to do a great variety of things concerning adult literacy, children, work, housing, and education. NS: So, campaigning around the issue of civil rights—or even something narrower like desegregating certain areas of American cities—opened the door for all these other issues? JL: It opened the door for the president and the Congress to see that there were a great variety of ways in which the quality of life of the whole society could be raised. Local organizing must converge at the point of agenda and bring together issues that affect a broad spectrum of people. A part of my thesis here is that we cannot resolve the issue of racism if we do not resolve the issue of sexism. We cannot resolve the sexism if we are not willing to deal with the forms of structural violence that destroy so many people. And we cannot resolve those if we do not deal with the issue of the injustice of economic exploitation—abuse and fraud and the rest of it. Greed must be brough under some kind of justice. You see, there is a huge set of secondary issues that will be affected by such a convergence. In the civil-rights movement, we were not only talking about Jim Crow law, or segregation. We were talking about the lack to access to work, to education, to housing—the lack of access across the board. The no-hiring-discrimination business affected more women than it affected black people. There has to be a spirit of convergence. Environmentalist groups, for instance, cannot really accomplish the well-being of our social, or natural environment—or the birds or the earth—if they are not willing to work on it in a way that’s going to affect and dismantle other kinds of injustice. NS: Has doing nonviolent resistance affected your spiritual views? And do you think that a new kind of spirituality is required for the expansion and growth and development of nonviolent movements? JL: The heart of spirituality, according to biblical thought, is to love God and to love the neighbor as yourself. I see nonviolent theory and practice as a fulfillment of that—maybe even the major fulfillment. It means that it is not a non-traditional spirituality, therefore, that’s necessary, but simply the ancient spiritualities that any number of world religions have tried to cultivate and encourage for centuries. A part of what nonviolent practice and activity has done for me is it has deeply escalated what I call my “confidence in the universe,” and my willingness to trust in its care. It has also greatly expanded my heart at the point of seeing people in a different light. I think that that’s at the fore of any kind of spirituality; it’s becoming more human. To become more human, your heart has to become more compassionate, more inclusive of other human beings. That’s what Jesus said. So, the spirituality of my childhood and teenage years has been greatly provoked and deepened and enlarged in ways that I could have had no imagination about before. How would I have known? How would you know as a child, as a teenager, or even as a student that this course of action would mean an expansion of life, of spirituality, of compassion for life? I had no notion of that. This is deeply encouraging to me and my own small efforts working on nonviolent transformation. I love the way Rev. Lawson links faith and strategy together. Congratulations on interviewing the Reverend James Lawson. His analysis of the situation today is correct — plenty of activists, not enough convergence. Our time now is akin to the 1930s and ’40s when African-Americans were saying “We need a Gandhi.” When the right spokesperson comes along to unify the disparate currents of the present moment, just as Martin Luther King did in 1959, hearts will start changing and reform will start happening. Also nice to see nonviolence connected to religion as the method of “true” religion. That’s the other thing missing today — a movement in which churches can participate. Thank you for bringing Reverend Lawson’s wisdom to light.